The residents of 490. Front row, from left: Celina Tragesser, Amy DeCelles, Elena Radtke, Margaret Bulger. 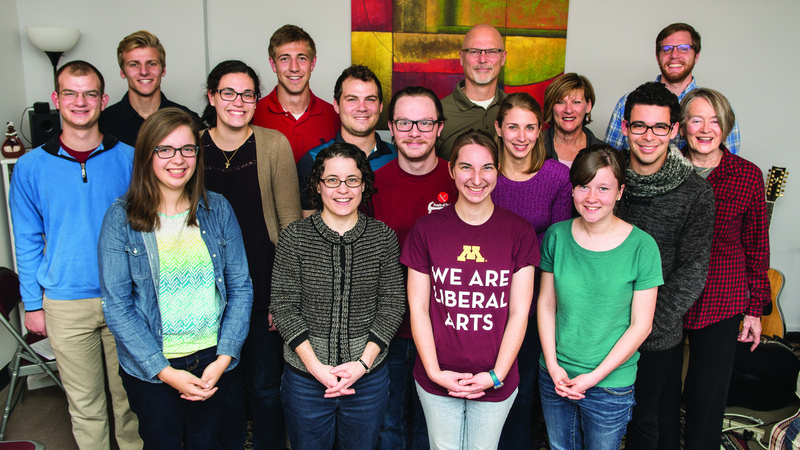 Middle row, from left: Jon Willard, Claire Rubio, Isaac Willard, John Gruber, Cathy Schwab, Alex Bendele, Kati Ritchie. Back row, from left: John Brickweg, Tony Kuplic, Bob Brickweg, Christine Brickweg, David Gruber. 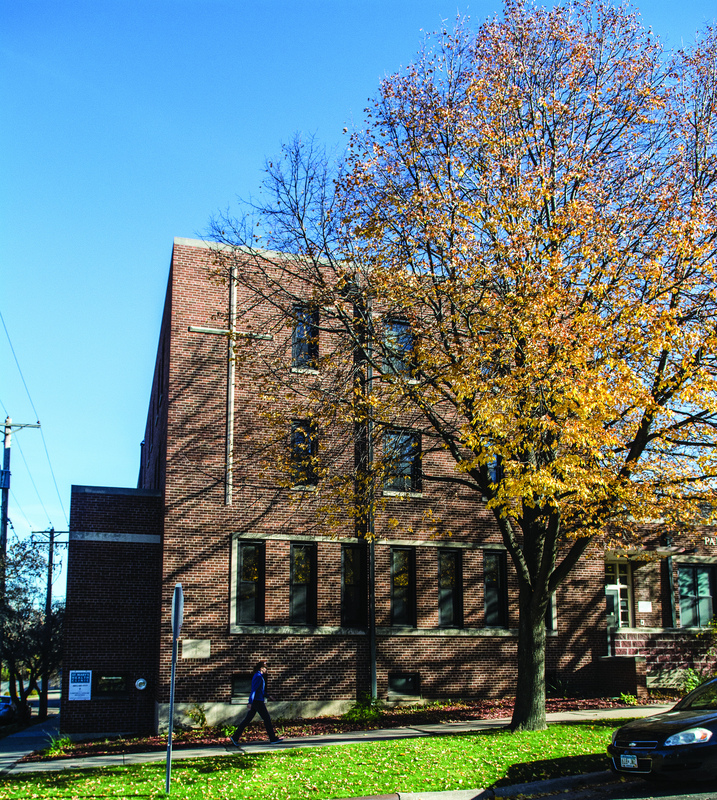 Sixteen Servant Branch members have taken up residence on the second and third floors of an old convent in the West Side neighborhood of St. Paul, an ethnically and economically diverse area of the city where the branch also has an outreach. 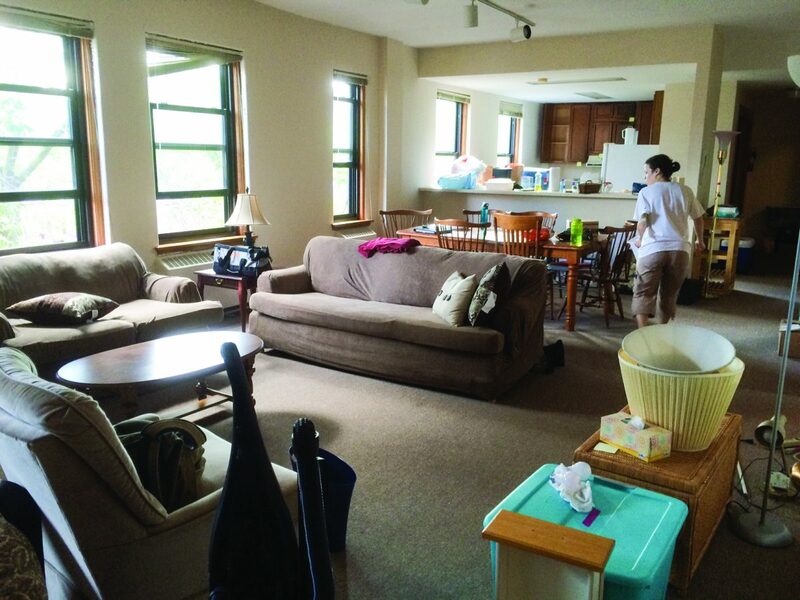 The group living in the convent includes two campus households (one for men, the other for women), one family (Bob and Christine Brickweg and their son John) and a single woman, Kati Ritchie. The convent is located on the grounds of St. Matthew Parish and had been vacant for several years, since its previous tenants, the Sisters of Notre Dame, had moved out. Their motivations for making the move vary. For the campus households, which had been living in Minneapolis near the University of Minnesota, the new location in St. Paul offered several practical advantages. The West Side is more central to all the colleges and universities the students are attending—not only the University of Minnesota, but also the University of St. Thomas, Inver Hills Community College, St. Paul College and Metropolitan State University. The new location cuts down on the commute time for some. The students also wanted to live in a neighborhood where other community members are living, and five other community households live within walking distance of the convent. Lastly, they were intrigued by the branch’s outreach on the West Side, and some of them hoped that their presence in the neighborhood would allow them to participate in outreach activities in the future. Bob and Christine simply felt what Bob called “a stirring in our hearts” to move to the West Side, and they’re keeping an open mind about what the Lord has for them in their new location. John, 18, had dreamed of spending his senior year living with the men’s campus household, so when his parents proposed the idea of living across the hall from them, he was thrilled. Kati says she has had a heart for the West Side neighborhood for more than 30 years, especially for its many Spanish-speaking residents. Each floor has one five-bedroom apartment and one three-bedroom apartment. The Brickwegs have the smaller apartment on the second floor, across from the single men’s household, and Kati and the single women’s household take up the third floor. Though the households have made no formal agreements, the close quarters provide many natural occasions for sharing their lives. John, a senior at Trinity School at River Ridge, says he can hear when the college men are having their evening prayer and can pop across the hall to join them. 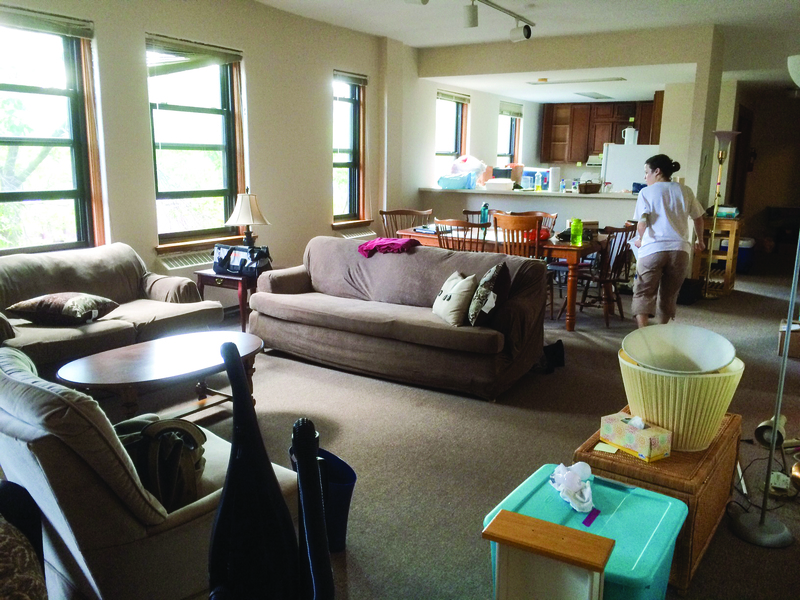 The common area of the women's apartment on move-in day. Celina Tragesser, one of the college students, spotted Kati outside the building collecting leaves for an art project, so she got to talk with her about her art. Celina says that living with other community members helps her keep a good perspective on her schoolwork—one bad exam isn’t the end of the world. “There’s a lot more life to live, a much bigger picture” beyond the stresses of college. Many in the group are forging new connections: with their West Side neighbors, with longtime parishioners at St. Matthew’s and the parish staff, with local business owners, etc.